• Disaster on the Dnieper—New Scenarios for Ukraine’43 by Trevor Bender: Trevor Bender returns to further dissect what makes a counterfactual scenario work, introduces a new scenario included with this issue of C3i, and provides a bonus scenario based around the Kursk Offensive, the largest tank battle in history. • Denmark—The World’s Largest Gaming Cooperative by Jason Matthews: Jason Matthews, co-designer of Twilight Struggle, journeys to a boarding school in central Denmark where they support their curriculum with LARPing (Live Action Role Playing) and general gamification, yielding very exciting and encouraging results. After facilitating the Cuban Missile Crisis writ small, he is invited to Fastaval 2017, a place where thousands of gamers from every subgenre gather to share and play games, as well as participate in game design contests. A really insightful look into Danish gaming culture. • Clio’s Corner #9: Take Me To Your Leader or “Where’s the ‘Bot?” by Mark Herman: “The first challenge is how to assimilate players of varying skill and historical knowledge into a new system, beyond learning the mechanics. I find that a ‘Bot can act as a surrogate strategy advisor on that all important first turn, when you have no idea what to do next… I thought it was time to talk about solitaire systems from a design point of view. I will approach this topic from my own personal journey and how my thinking has evolved on this topic over time with some of my key findings in what is loosely call 'My Beginner’s Guide to ‘Bot Design,' with myself in the role of the beginner." •	Holland’44—S3 Northern Scenario by John Davis: This scenario covers the actions of the 82nd and 1st Airborne Divisions, and the attempts by 30 Corps to break through to Arnhem. It covers the initial air drops through to 22nd September, after which increasing German attacks on the fragile 30 Corps supply corridor made further Allied progress increasingly difficult. 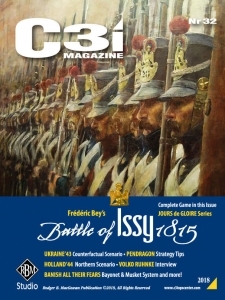 • C3i Interview—Ben Hull by Sam Sheikh: Ben Hull is a game designer and U.S. Marine officer who is well known for designing the Musket & Pike Series and Fields of Fire. He is currently working on creating the new Bayonet & Musket Series (GMT Games) with Volume I: Banish All Their Fears depicting the Battles of Neerwinden 1693 and Blenheim 1704.